I am a big fan of employer-sponsored retirement plans (401K, 403B, TSP, etc.). They are a great way to save for your retirement. You can take a current year tax break for the money you save (traditional) or you can take your tax break in the future (Roth). Whether you should choose traditional or Roth is usually a combination of personal preference and your current circumstances, but either provides advantages over saving in a non-qualified account. Most employer-sponsored retirement plans have some provision for the employee to take out a loan. The theory is you are in a financial bind and need temporary access to your money. You borrow it from your retirement account and then pay it back over a period of time – typically with a payroll deduction. I am not such a big fan of these loans. I suppose it is good to be able to access the money in the event of an emergency, but all too often I find people are using them for situations that are not emergencies. This degrades the account’s primary purpose of retirement savings. Even though the amount borrowed must be paid back, money taken from the account as a loan loses some very valuable compound growth potential. Borrowing the money now nearly guarantees having less money in retirement. The rules on 401K loans are also very strict. You could even call them draconian. (I have Game of Thrones fever as I am writing this!) 401K loans are governed by both the Department of Labor and the IRS, and neither is very forgiving as government agencies go. The money borrowed has to be repaid in relatively equal increments over the period of the loan. If a payment is missed it must be made up within a fixed “cure” period. If just one loan payment falls outside the cure period the entire loan is considered to be in default and is no longer a loan. It is now a distribution (withdrawal) from the retirement account – and all applicable taxes and penalties will apply. If you have taken, or are considering taking, a loan against your 401K, you need to be very careful. You will be held accountable for the loan payments even if it isn’t your fault the loan payment isn’t made. Just ask Mrs. F from New York. Mrs. F worked for 'Company G'. She was a participant in Company G’s 401K plan, which was administered by 'MOA'. In 2012 Mrs. F arranged for 12 weeks of maternity leave from Company G. She had enough leave time accrued to be paid for the first 5 weeks, but the last 7 weeks would be without pay. Just prior to her maternity leave she also took a loan from her 401K. She arranged to repay the loan by having money withheld from her Company G paychecks over the period of the loan. Mrs. F went on maternity leave. Someone in Company G payroll neglected to set up the withholding for the 401K loan repayment from Mrs. F’s pay. While on leave Mrs. F received her paychecks via direct deposit, but did not notice the loan repayment amount was NOT being withheld. She did not notice the loan payments were not being withheld until after she returned to work following her maternity leave. At that time she made a triple-sized payment followed by several over-sized payments until the amount repaid was caught up to the amount that should have been withheld from the beginning. Once caught up she continued repaying the loan through payroll withholding per the loan agreement. It was too late. When she missed the initial payment, and did not make it up during the cure period, MOA declared the loan in default. Unfortunately, they didn't tell Mrs. F. In January 2012, they issued Mrs. F a 1099-R, but didn’t mail it to her. They posted an electronic version to their website. Mrs. F did not routinely check the MOA website, so she was unaware the 1099-R had been issued. In fact, she continued to repay the loan into 2014 – and MOA continued to receive the payments without telling her the loan had defaulted and she was not required to repay it. In 2014 the IRS notified Mrs. F she had not declared all her income from 2012. They charged her taxes on the amount of the defaulted loan from her 401K, a 10% penalty for early withdrawal, interest on the above, and a 20% accuracy penalty for negligence. Mrs. F petitioned the US Tax Court for relief. Things did not go well for Mrs. F at Tax Court. The judge ruled it was her responsibility to ensure the payments were made before the cure period expired, and she did not. Therefore the tax, 10% penalty, and interest must be paid. It didn’t matter that Company G screwed up on the withholding for the loan repayment. It didn’t matter that MOA never made sure she knew her loan had defaulted. It was her responsibility and she did not follow through. Fortunately for Mrs. F, the judge found there was a reasonable basis for Mrs. F to believe she did not owe tax on her loan. Therefore, he removed the 20% accuracy-related penalty for negligence. In my opinion Mrs. F got a raw deal. She was at home birthing a baby. I think it is a reasonable expectation on her part to assume her employer is going to get the pay withholding correct and the 401K administrator would make a little effort to ensure she knew the payment was late. It was their negligence, not hers, that caused this situation. Perhaps she can get some restitution from Company G or MOA via other legal channels. But the rest of us should learn a valuable lesson from Mrs. F’s experience. 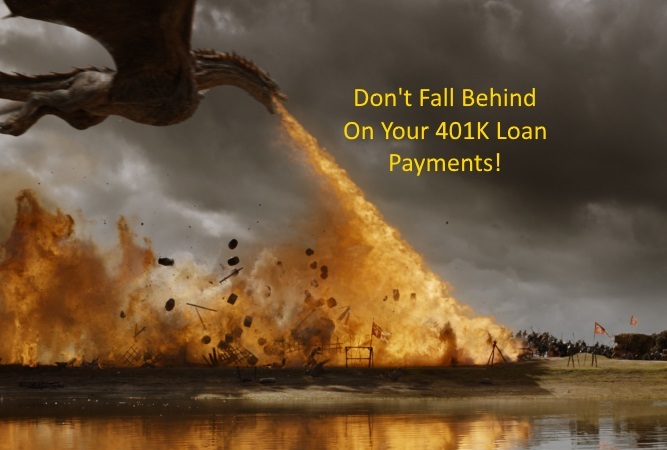 401K loans come with tax rules attached.The IRS is unforgiving. Tax rules are tax rules – and it is the responsibility of every taxpayer to ensure they are compliant with those rules. Failure to do so can have expensive consequences. If you have questions about taking a 401K loan, please contact me.